An adequate blaster that doesn't quite live up to expectations. 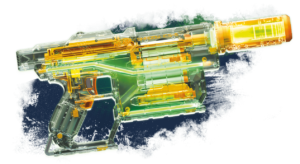 After the success of the Ghost Ops Evader, Nerf has elected to release another clear, light-up blaster. This time, it’s the Ghost Ops Shadow ICS-6. Holding six darts in an internal magazine, the blaster is fun to use and performs acceptably as a blaster. However, if you aren’t interested in the aesthetic aspects of the blaster or are looking for better performance (or modification), there are better blasters out there. The Shadow, like the Evader, features several green LEDs within, activated by a secondary trigger; in this case, it occupies the space normally taken by acceleration triggers in flywheel-powered blasters. An extra LED sits at the front of the blaster and is turned on when barrel attachments are connected. Parts of the blaster aren’t quite as well illuminated as others, but that’s simply a matter of space – plunger tubes and the like are going to to block the light, and making clear internal parts drives up the price more. Apart from the LED gimmick (which I personally love), the blaster operates much like other magazine-fed blasters. 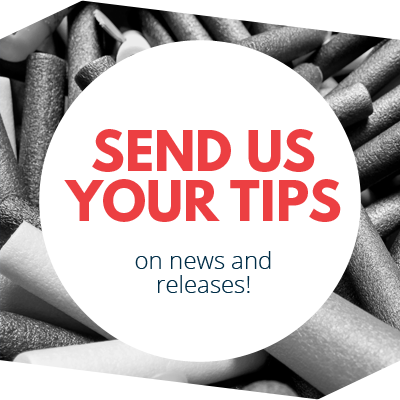 You pull back the priming handle to charge the spring-loaded plunger, and load a dart for firing. Pulling the main trigger fires the dart. It’s a simple blaster to operate, averaging (in my tests) 59 fps out of the barrel and two darts per second. That’s not quite up to par with other modern Nerf dart blasters, but it’s certainly good enough for the average buyer, or for small children. The blaster’s internal magazine is loaded by pressing down darts between the lips at the top of the blaster, prior to priming the blaster. In that way, it’s technically an open bolt mechanism. There is a tab on the front darts must squeeze past, which slows down loading a little. In the end, being able to load a magazine on the fly is still handy. Blaster operation may be simple, but the actual mechanism for loading darts is vastly different from other blasters. This part should give pause to anyone buying the Shadow ICS-6 with modification in mind. In addition, while the plunger tube is large enough for Elite distances (along the lines of a Strongarm, for example), the actual plunger is only pulled back ~1.4 inches, and stronger springs can actually flex the plunger enough to prevent it catching. In the end, there isn’t much air being compressed for firing the dart. There is also not much to be done in terms of compressing that air more quickly. The open bolt design of the Shadow ICS-6 would normally require something larger than a pistol format. For example, think about the Stampede or the Centurion. Instead of a large mechanism for moving the plunger tube and barrel, the Shadow opts to instead move the dart backwards into a relatively small barrel. A hollow, tubular shuttle with a retracting loading tab acts to load the top dart. It also presses down the rest of the darts in the magazine. This prevents the magazine spring from exerting any force on the loaded dart as it fires, so that it fires properly. This open design, while compact, results in a short dart barrel with no way to efficiently enclose the dart to boost performance. That, combined with the plunger issues, means that what you see is what you get in terms of blaster performance. From the hobbyist standpoint, it’s frustrating. From the viewpoint of a casual shopper, though, that really might not matter. 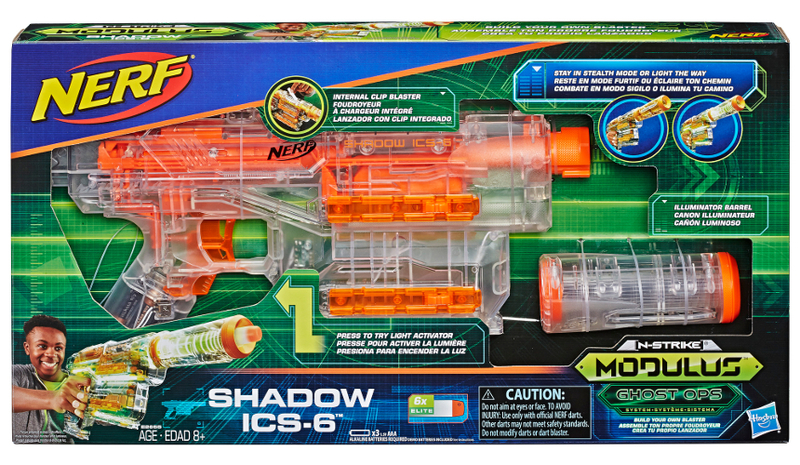 The Ghost Ops Shadow ICS-6 is an adequate performer among Nerf’s new offerings. It doesn’t have quite the punch of other blasters on the market, but it does have fun alternative play in the light system. For a normal buyer, this blaster will probably be a nice purchase. If you’re looking for power, however, a Disruptor would offer better performance (and equal capacity) for less money, and that’s only looking at Nerf. 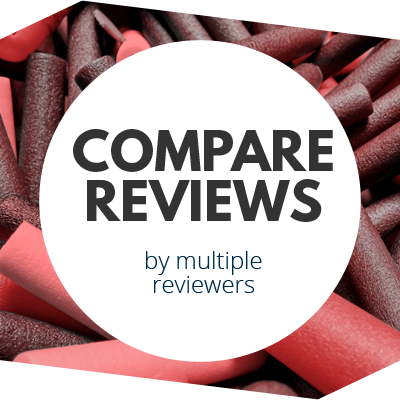 This entry was posted in Dart Blasters, Reviews and tagged 2019, blaster, blaster hub, elite, ghost ops, hasbro, modulus, nerf, review, shadow on February 1, 2019 by BuffdaddyNerf.